“I stand before the painting, which is small and, frankly, ugly; I can admit that at last, I can finally see it, since it no longer represents serendipitous millions or retrieved history or much of anything more than a garish trio of midnight revelers on the Andrassy ut….Receding echoes of the last war mingle with the next war’s approaching thunder, ahead of which the jittery brushstrokes struggle to remain. The work is hobbled by interwar deprivation: brittle cardboard in lieu of canvas, the cheap paints cracked with age.” Matt Santos. On the night before an auction of world-class paintings, thirty-something Matt Santos gets permission to spend the night at the auction house “saying goodbye” to “Budapest Street Scene,” painted in 1925 by Hungarian artist Ervin Kalman. Although Matt is considered the owner of the painting, he has, in fact, just recently learned about his connection to the painting as part of the on-going repatriation efforts made for paintings stolen by the Nazis. Matt has a family picture of his grandfather’s living room in Budapest, in which the painting is shown on the wall, but he has never known anything about it in real life, and when investigators finally tracked him down and told him that the painting would be “returned” to him, he could not understand why his estranged father had already refused to accept it, even though it is worth millions of dollars. As he spends the night staring at the painting and thinking about his family, what he knows of their history in Hungary, and how he relates to them in the present, he is accompanied only by a night watchman from the Vigil security firm, a man he addresses as “Virgil” in this vibrant, novel-length monologue. 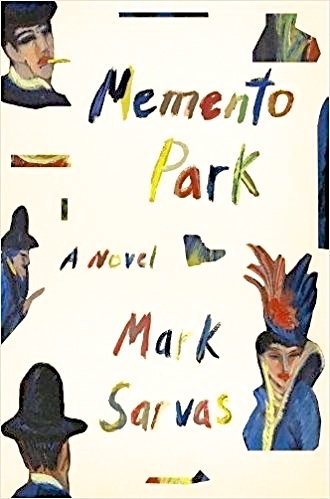 Author Mark Sarvas involves the reader from the outset of Memento Park as Matt spends a long night delving into memories going back three generations, considering whether they reflect truth or merely his interpretation of it based on his own experience. At the same time he also reflects on his present life in Los Angeles, where he has been working as a “reliable, drama-free,” B-list actor and living with his model fiancée, who spends her free time working on social causes. Ultimately, Matt relives his very recent trip to Budapest, describing what he has learned about the artist, and exploring his own Jewish roots for the first time. Staring at the painting in the auction house, he admits, “I find myself wondering yet again how I could have failed for so long to see this painting for what it is, a rotted memory, an epitaph to everything I thought I knew.” For the reader, it is equally an epitaph on the self-centered, disconnected life Matt Santos has been living to date. As he shares his life and thoughts with the reader, the novel develops into a complex personal story, at the same time that it is also a story filled with mysteries. And when another person challenges his ownership of the painting, the novel becomes more involving, raising questions about what happened to it after 1944, when his grandfather used it to obtain the papers he needed to escape Hungary with his son Gabor, Matt’s father. 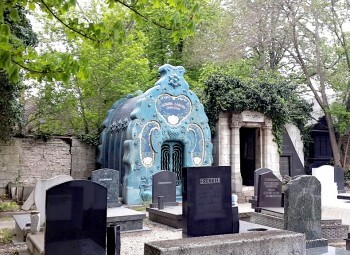 The fictional artist Ernst Kalman was said to be buried in Kozma Street Cemetery, a few tombs away from the Blue Tomb here. Photo by Lazlo Lihi. As a character, Matt can sometimes engage a reader’s sympathies, but he is a challenge for a reader to like or admire. He has few strong values, a difficult relationship with his father, and minimal connection with his bohemian mother since her divorce from his father when he was a young teen. Perhaps it is lack of close ties that has made him successful as a young actor, someone who can easily slip into secondary roles and blend into the background of a film. 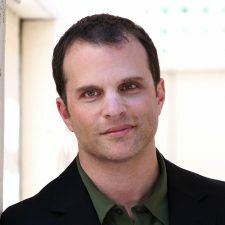 Engaged to marry Tracy, a model who is currently spending her free time supporting the legal case for a convicted murderer on Death Row, Matt is nevertheless vulnerable when he meets Rachel, the attorney helping him to prove his connection to the Kalman painting. Rachel’s commitment to her own Jewish heritage begins to fascinate him, and he begins to experiment, at least superficially, with his own cultural roots, attending a synagogue for the first time and joyously nailing a mezuzah onto his own doorpost. Soon he is “in love” with two women, unable to concentrate on his work. Life becomes more complicated as he becomes jealous of Tracy’s photographer, and Tracy becomes jealous of Rachel. 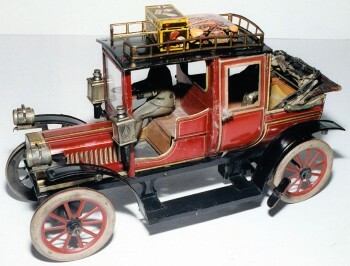 Gabor Santos, Matt’s father, is a collector of antique toy cars. 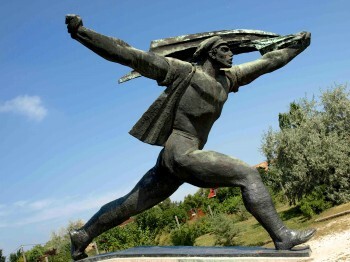 Memento Park in Budapest contains the monumental sculptures from Hungary’s Communist era. Photo by Prosopee. Eventually, Rachel, hoping to find real evidence of the original purchase of the Kalman painting by Matt’s family, suggests they take a trip to Budapest to interview his now elderly cousins there. His grandfather and then-four-year-old Gabor had left in such a hurry that they could not take much with them, and the hope was that the family left behind might have found the documents. In Budapest, Matt explores the universal themes of memory, love, family, religion, and responsibility. Time shifts from one subject area, set of characters, and time into other subjects and times here, leaving some tantalizing questions unanswered in one area while slowly revealing information in others. In this way Sarvas maintains suspense while expanding the character of Matt slowly, and though the novel has fewer than three hundred pages, it is compressed in such a way that it feels longer and more complex than other novels of its length. The book does rely on coincidence and novelistic “magic” to resolve some of the issues of plot and character, however, and much of the emotion generated is sentimental, rather than subtle. As Matt opens himself more fully to life and love on all levels, however, he becomes more self-aware, leading to a grand resolution and a long overdue coming-of-age. 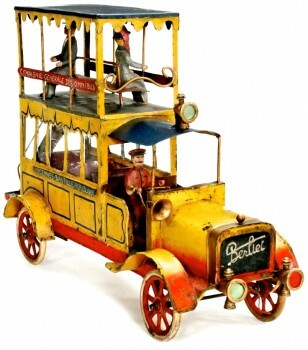 Berliet double-decker tin bus from the workshop of Parisian artisan Pinard (perhaps similar to some belonging to Gabor Santos in his dreams), recently sold for $10,270. The monumental sculptures from Hungary’s Communist period have been relocated to Memento Park in Budapest. https://commons.wikimedia.org/ Photo by Prosopee.